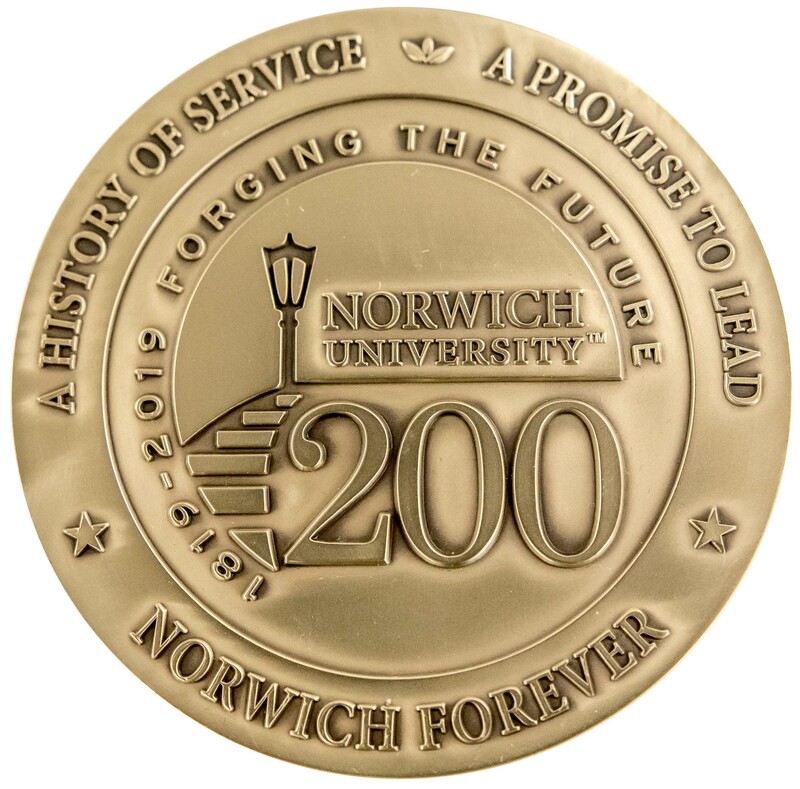 For 200 years, Norwich University has been educating citizen soldiers to serve, defend, and build the republic, as both uniformed and civilian leaders. Here, for the first time, the 200-year legacy of this venerable institution is presented in a single volume, highlighting the tremendous contributions of Norwich-educated leaders to our military, our nation, and the world. 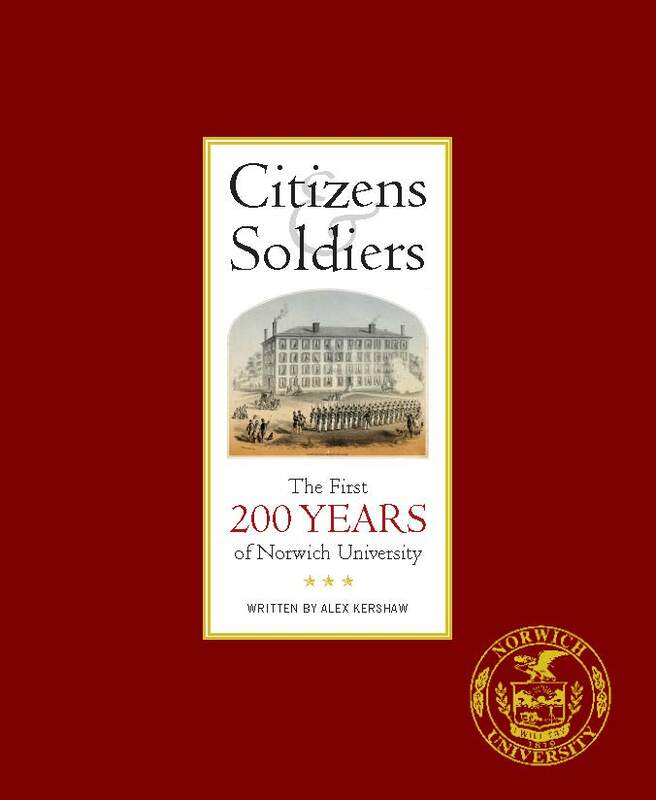 New York Times bestselling author Alex Kershaw brings this remarkable story to life in a beautifully written and illustrated book on the history and heritage of the nation’s oldest private military college titled Citizens & Soldiers: The First 200 Years of Norwich University. 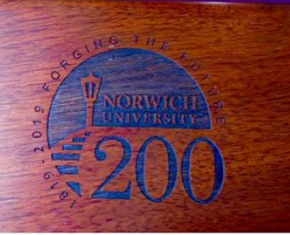 From its revolutionary beginnings to its rise to prominence on the world stage, the evolution of Norwich University closely parallels that of our nation. Captain Partridge’s mission to create “moral, patriotic, efficient, and useful citizens,” and his radical ideas about educating citizens and soldiers through an experience-based curriculum, have withstood the test of time. Through vivid storytelling, stirring photographs, and captivating illustrations, Kershaw’s Citizens & Soldiers captures the essence of the timeless Norwich ethos. Click here for more information on the book, and to order this commemorative piece. 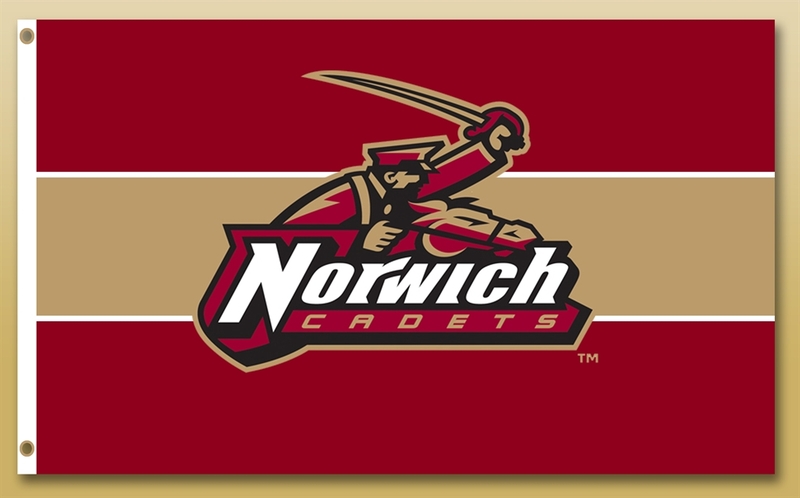 Norwich University. Today. Tomorrow. Norwich Forever. 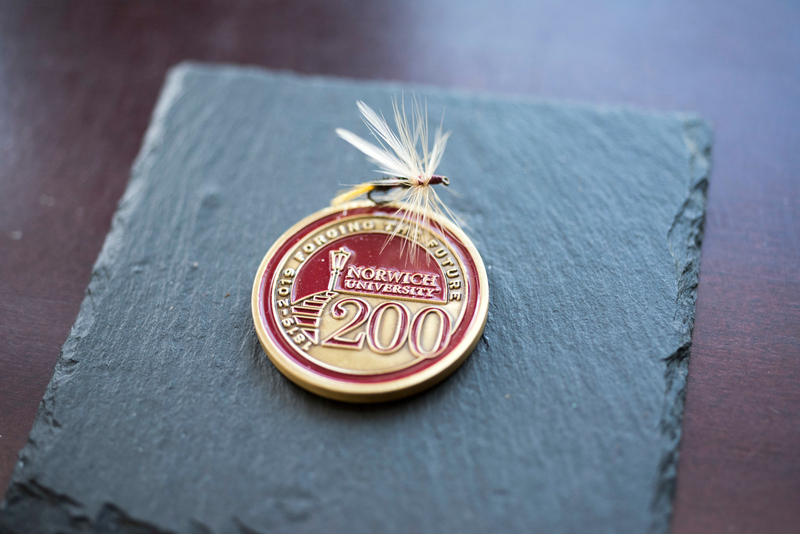 To commemorate Norwich University's bicentennial, and in celebration of the rich heritage and traditions that define this remarkable institution, the Norwich University Alumni Association presents Norwich University. Today. Tomorrow. Norwich Forever - a year in photographs of life on the Hill. From orientation to graduation, the barracks and the residence halls, academics and athletics, CGCS Residency, and the Green Mountains that surround the campus, the images enshrined in this hard cover book speak to the beauty, camaraderie, commitment and lifetime bonds formed over the past two centuries. Each one is unique for the way in which it changed, influenced, or marked a moment in time. 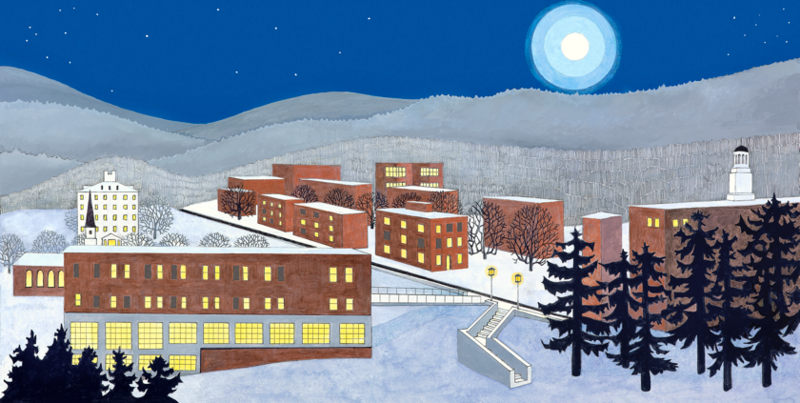 To commemorate Norwich University’s bicentennial and the opening of Mack Hall, Vermont artist Sabra Field created a stunning mural titled “Winter Twilight, Norwich University.” The original artwork is permanently installed in the foyer of Mack Hall and you can own one of the 200 limited edition prints. They are 8”x16” (unframed) and signed and numbered by the artist. Click here to order yours now! To read more about the artist, please click here. 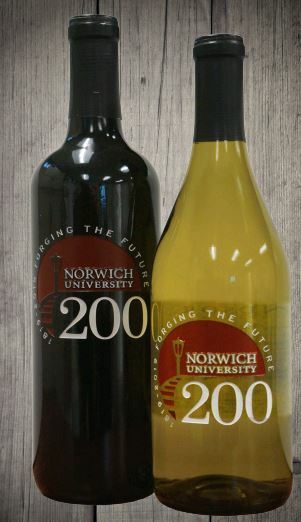 WINDSOR VINEYARDS of Santa Rosa, CA has designed beautiful bottles of Chardonnay and Cabernet Sauvignon commemorating Norwich’s bicentennial. You’ll find the wine delectable and the bottle a timeless keepsake. A number of options, including personalized bottles, are available. Henry, America’s most storied rifle maker, is producing a limited edition .30-.30 rifle to commemorate Norwich University’s bicentennial. Each masterpiece of finely crafted gunsmithing is numbered and features Norwich’s bicentennial logo engraved into the American walnut stock. The H009B has a visually impressive 20″ octagon barrel and a handsome brass receiver and brass barrel band that is drilled and tapped for easy scope mounting. The magazine holds five rounds that chamber quickly and smoothly for crisp, perfectly machined action. It is both lightweight (just 8.3lbs.) and maneuverable (39″ long). Like every Henry rifle, it’s 100% American made. Click here to fill out the order form. Please mail completed form to R&L Archery, Inc. 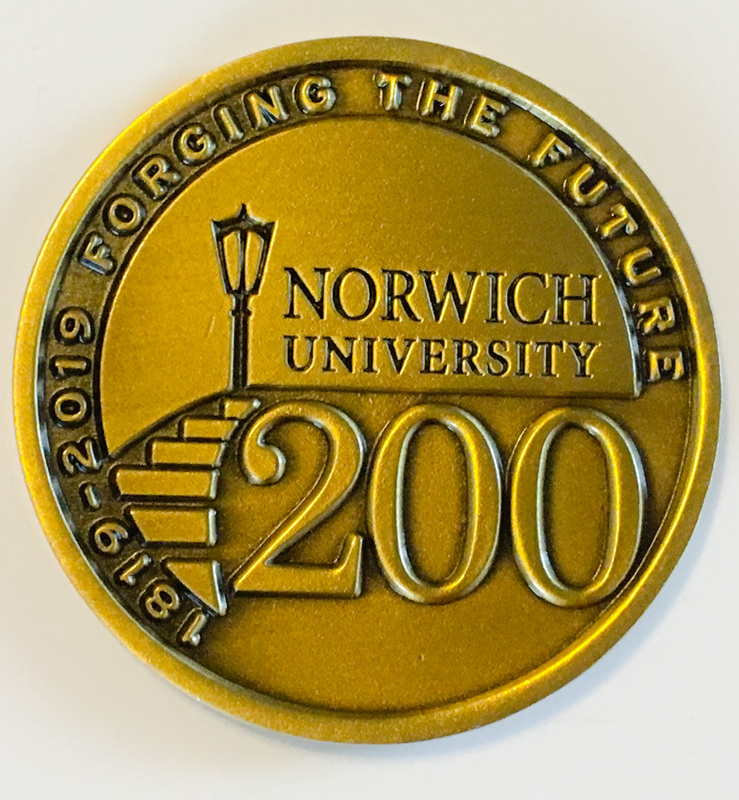 The Norwich University Bicentennial Coin celebrates the 200th anniversary of the founding of our institution. This coin is 3/4" wide and comes in a clear plastic protective sleeve. We hope you will carry and display it with pride! Click here to purchase one today! This exclusive Bicentennial Blend is produced by Capitol Grounds, a small, independent roaster in Montpelier, VT. Dan Cox, NU '71, CEO of Coffee Enterprises and a leading authority on the Specialty Coffee Industry consulted on this project to enhance the quality of the blend. Guaranteed to transform your morning! Click here to order this exclusive coffee today! Capt. Alden Partridge lives on in this 8" bobble head. The staff of the Sullivan Museum & History Center consulted on the design to ensure the historical accuracy of Capt. 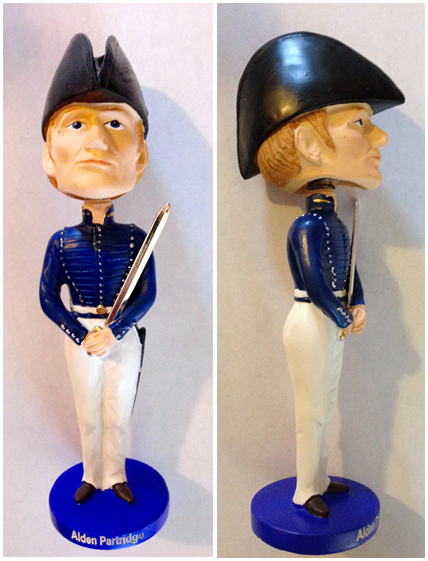 Partridge's uniform from his bicorn shako (hat) to his boots. Click here to order one today! 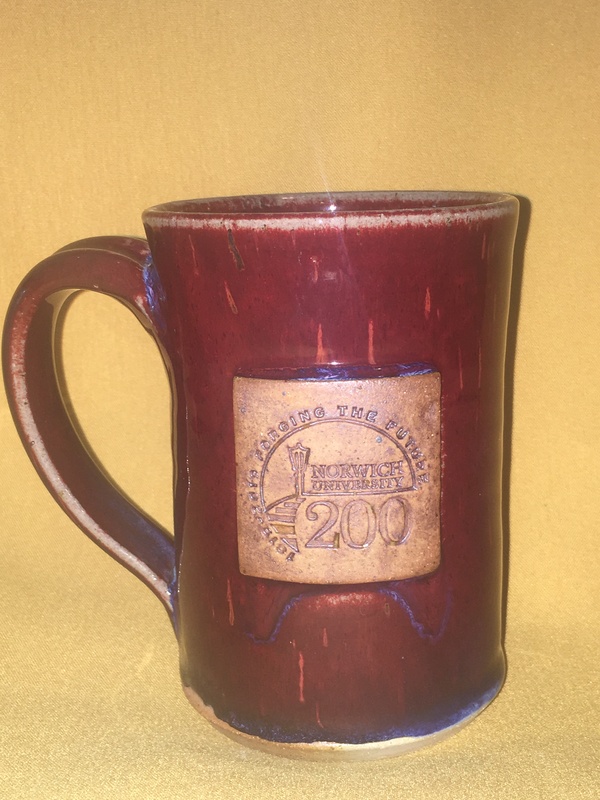 Beautiful hand-thrown sturdy ceramic mugs by Vermont potter Art Wilt of Burning Mud Pottery & Gallery, Roxbury, VT, are glazed using his extremely volatile and absolutely gorgeous copper red glaze and feature Norwich’s bicentennial logo. The handmade nature of these mugs means the dimension and color vary slightly. They are dishwasher and microwave safe. Click here to order your hand-made mug and stein! 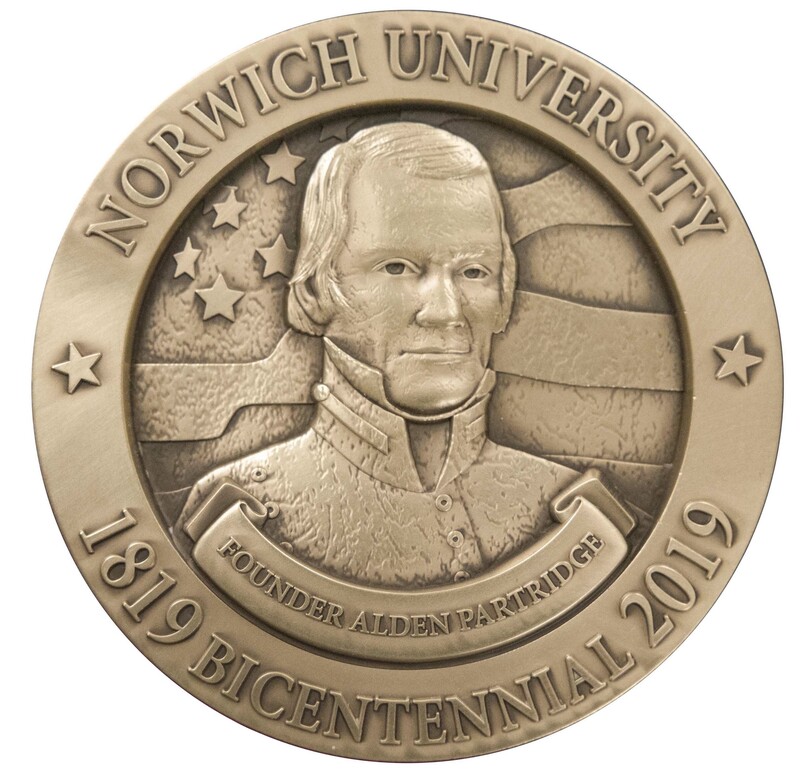 The “Captain Partridge” fishing fly mounted on Norwich University’s bicentennial challenge coin has an historic lineage extending back to the 1830’s. This remarkable fly is hand tied by Yank Shugg ’68 and beautifully displayed on a 4"x4" piece of slate and comes packaged with a display stand and an informational insert detailing the history of the fly. Fishing flies are available as a display or a 2-pack; Click here to order. 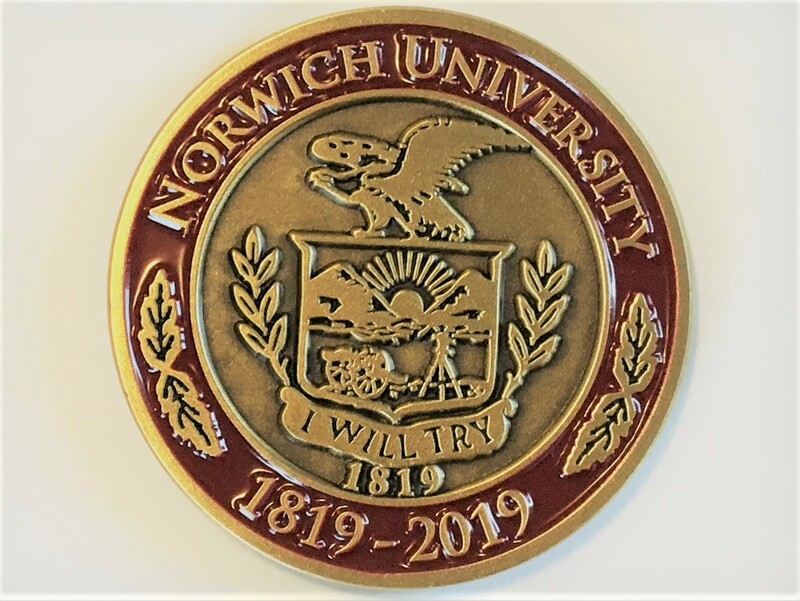 Celebrate your Norwich pride at home and at the office with this heirloom collectible quality bronze 3” diameter and ¼” thick two sided, sculpted and cast medallion. The high quality piece comes in a maroon and gold gift box with separate acrylic stand. Proudly made by the Medallic Art Company (1903 est. ), our nation’s oldest private mint. 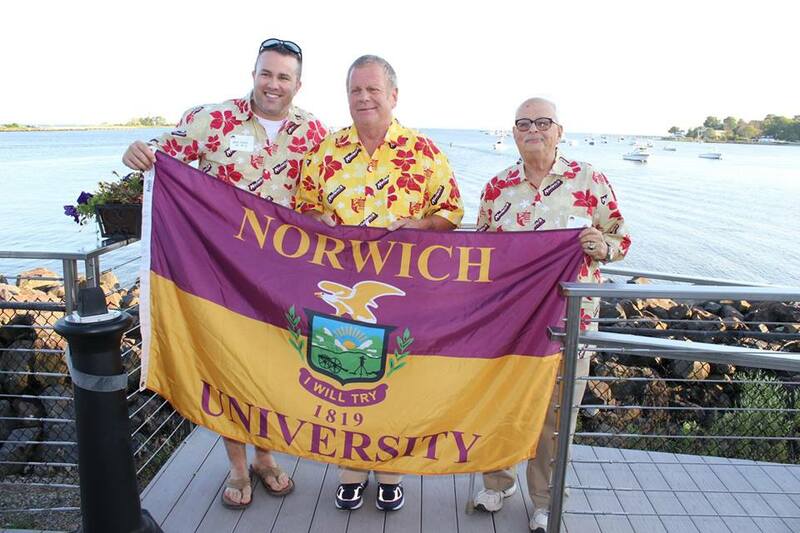 Click here to share your Norwich pride at home or in your office! Norwich and KA-BAR are a match made on the battlefield. Made in Olean, NY since the early 1900s, KA-BAR Knives have been used in all American conflicts since WWII. Today, KA-BAR is used by the US Army, US Navy, and US Marine Corps around the globe, as well as campers and hikers at home. Blade length is 5.25" and overall length is 9". Please keep in mind that per university policy, students are not allowed to have knives on campus. Click here to purchase this limited edition KA-BAR today! This quality tie is 100% imported silk with double wool-blend lining. The design is Norwich maroon and gold, featuring the retro NU logo in a repeating pattern. The Bicentennial logo is on the back. 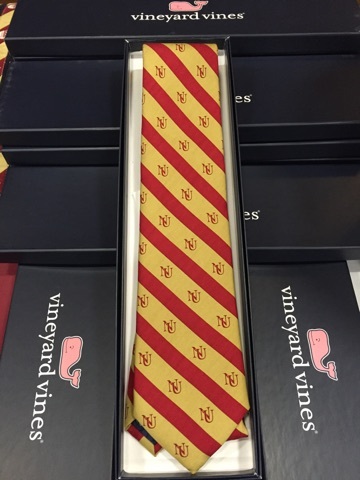 The tie comes in a classic Vineyard Vines gift box. Click here to order one today! These ties make a great first impression at any interview or internship! 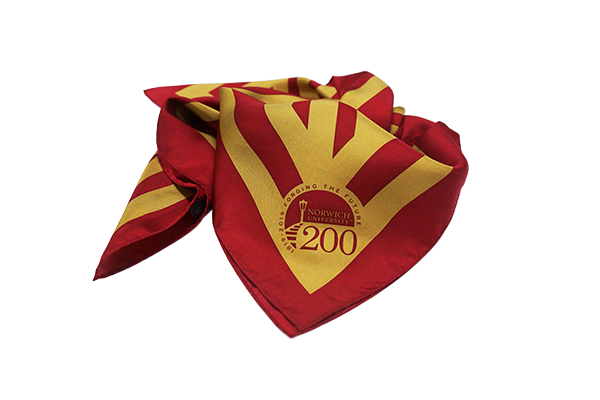 This quality 34.5" x 34.5" scarf is 100% imported silk. 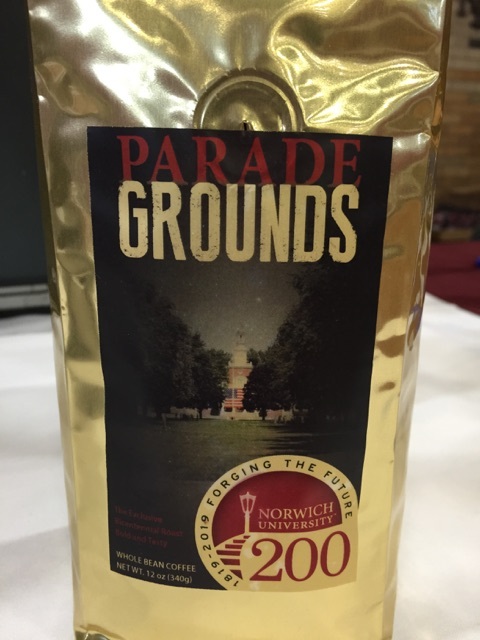 The design is Norwich maroon and gold featuring the Bicetentennial logo in the corner. The scarf comes in a classic Vineyard Vines gift box. Click here to order one today! This quality belt is 100% Italian bridle leather with the Bicentennial logo imprinted silk on a cotton canvas with brass buckle. 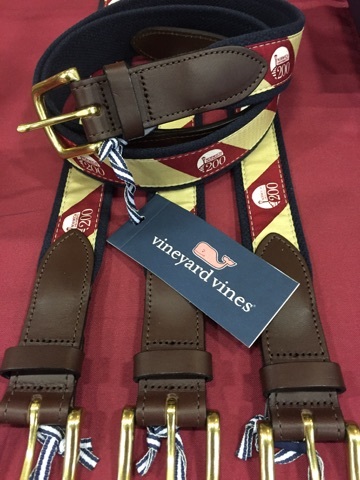 The embossed signature Vineyard Vines whale logo is on the leather ends. Click here to order one today! NOTE: supplies are limited, not all belt sizes available. 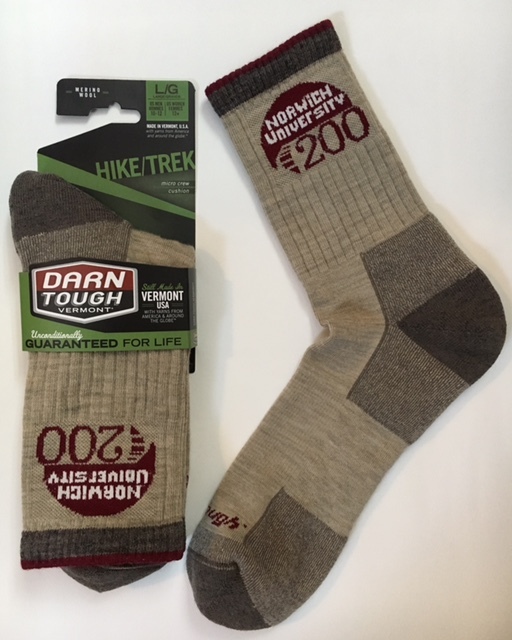 Like Norwich alumni and students, these socks are darn tough! Handcrafted in Northfield, VT, this high quality merino wool sock is meant to last and comes with a lifetime guarantee. Bicentennial logo embroidered on both sides. Socks are available from sizes Small - X-Large. Click here to order your made-in-Vermont socks! Limited time only! Click here to order! NU Hawaiian Shirts will be available until we are sold out! 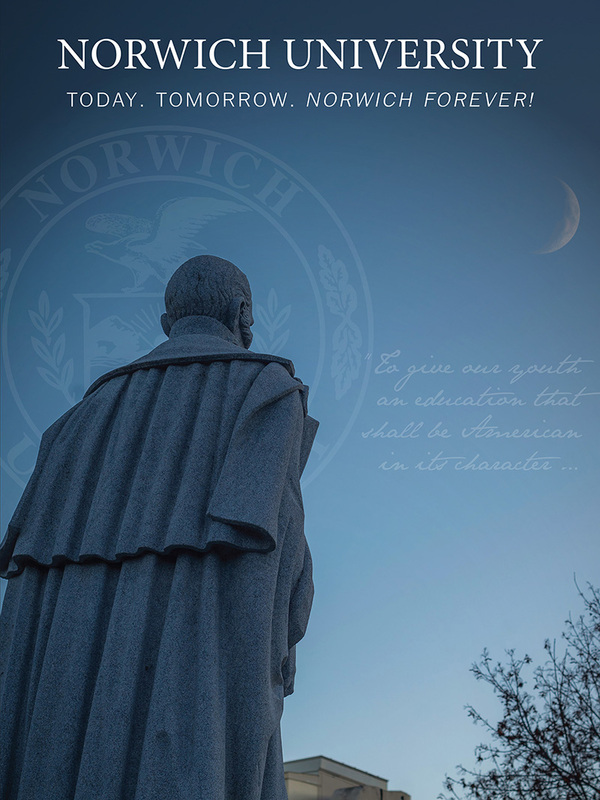 Available in 3 sizes: 4'x6', 3'x5', 12"x18" - Click here to show your Norwich pride! Flag sizes: 4" x 6" - Click here to show your Norwich pride! Large flag size: 3'x5' - Click here to show your Norwich athletic pride! Elegant qualist boasting a wider and flatter profile with a dark satin mahogany colored finish with acid free maroon and gold double matting with the University name and seal emblazoned in gold. Frame size: 15" x 21" - Click here to order your frame today! High quality, walnut finish, hardwood frame, complete with acid free maroon and gold double matting with the University name and seal emblazoned in gold. Frame size: 15" x 21" - - Click here to order your frame today! High quality, polished (frosted) gold frame, complete with acid free maroon and gold double matting with the University name and seal emblazoned in gold. 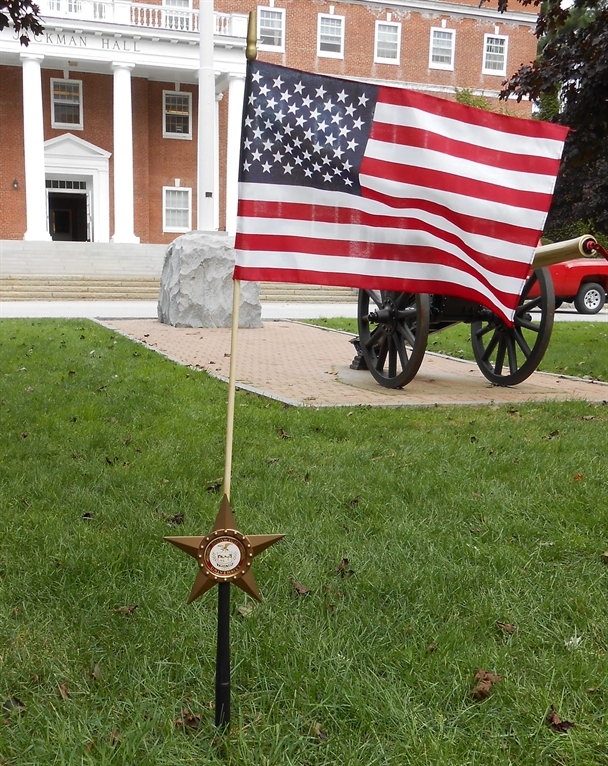 This durable, die cast aluminum flag holder is protected with a weatherproof bronze finish and sports the Norwich University seal. Whether used as a cemetery memorial, a yard decoration, or placed on a patio planter, this flag holder is sure to please you, your friends, and family for years to come. 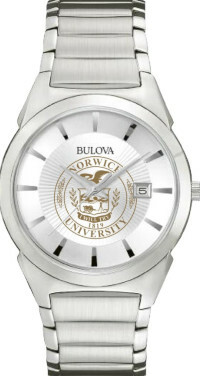 These beautiful, special-edition men's timepieces arrive elegantly boxed, and make a phenomenal gift for the proud Norwich graduate in your life! Crafted by Bulova, this unique watch features the Norwich seal, a scratch resistant mineral crystal, precision quartz movement, and a two-year warranty. Quantities are limited, so get yours while supplies last. To download an order form, please click here. Missing your Norwich University War Whoop? Need a gift for a new graduate? Yearbooks are available for purchase from class years 1970 to 2018 (there are no yearbooks available for 2015), however, some of the older class years are limited in quantity, so get yours today! They make a great gift! The cost of “Rook Week” DVD is only $20 and can be ordered online by clicking here. Past year's DVD's are still available. Choose the year you would like to purchase based on the information below. The cost of “Rook Dog River Run Company Photo is only $10 and can be ordered online by Clicking here. The Norwich University Commencement and Commissioning Ceremonies are monumental moments. Celebrate your graduate's success by owning your own copy of the Commissioning, Undergraduate Graduation Ceremony or the CGCS Commencement Ceremony. Click here to order. 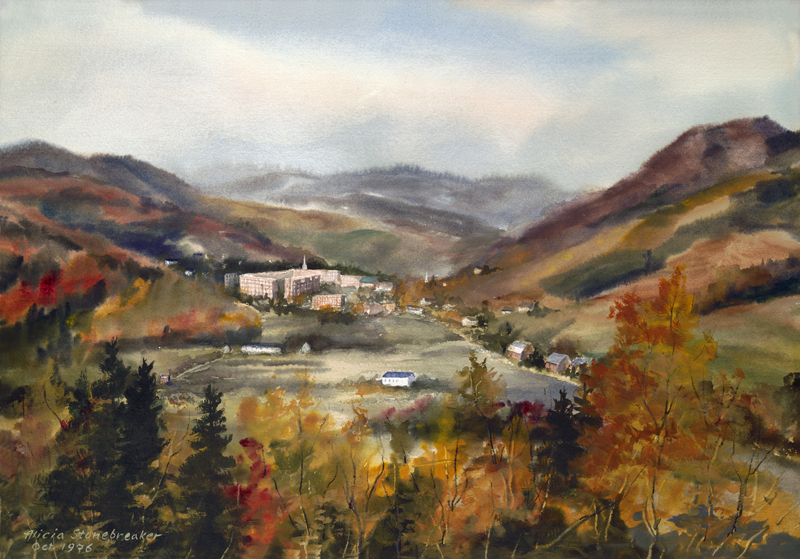 Purchase a print of Fall in the valley, showcasing the beauty that surrounds our campus. Click here to be brought directly to Alicia Stonebreaker's wesbite. Purchase Rook and Senior portraits of your students to keep for future memories. Click here to be brought directly to the photographer's wesbite.